Clad proudly in an England vest, Aaron Scott ran the perfect race as he recorded a new marathon personal best in Frankfurt on Sunday. A summer of hard training paid off for the Stamford-based flyer as he breezed round the course in a time of 2:16.55, knocking nearly a minute off his previous best of 2:17.46 set in the 2017 London Marathon. Jordan Foster on the podium in Lucerne. Scott picked up the prize for first local in the recent Great Eastern Run half-marathon, but in a display of disciplined running refused to get involved in a tussle for the much larger winner’s prize and ran the entire 13 miles at his goal marathon pace. This single-mindedness paid off and he paced the marathon almost to perfection. “I am delighted with my time and I felt brilliant throughout, something that rarely happens in any race, let alone the marathon,” said the Lincoln Wellington AC star. “It was a cold day and we had a very stiff breeze to contend with on parts of the course. The Nene Valley men's team that ran in the British Masters Cross-Country Relays. From the left they are Dave Neal, Darryl Coulter, Barry Warne, Sean Beard and Paul Parkin. Scott finished 22nd, but with a host of Kenyan, Ethiopian and Japanese athletes ahead of him, was the second European finisher. Nene Valley Harrier Jordan Foster realised a dream when running 2:58.37 at the Swiss City Marathon in Lucerne. With Sunday’s temperatures hovering just above freezing all day, it was a huge contrast to Foster’s marathon outing in London in April when the mercury soared towards 30C. The Nene Valley ladies team that ran in the British Masters Cross-Country Relays. From the left they are Lindsey Lister, Laura Grimer and Ruth Jones. With a target of under three hours, the 27 year-old local runner judged her pacing to perfection, running the second half of a surprisingly flat course just a few seconds slower than she ran the first half. As ‘projectmarathongirl’ Foster has a huge Instagram following and excitedly posted the morning after: “I don’t think it has really sunk in yet that I now have a marathon time which begins with a two, and that I managed to finish third overall in an international marathon. Two teams of Nene Valley veterans travelled to Long Eaton for the British Masters Cross-Country Relay Championships on Saturday. The Over 35 ladies finished seventh, with Ruth Jones the quickest team member covering the 3km course in 12:14. Despite having an average age of 52, the Over 45 men’s team finished 10th. Dave Neal was quickest with an 11:43 leg. Ladies times: Ruth Jones 12:14, Lindsey Lister 13:06, Laura Grimer 13:27. Men’s times : Dave Neal 11:43, Darryl Coulter 12:28, Paul Parkin 12:53, Barry Warne 13:13, Sean Beard11:52. Peterborough AC’s Dominic Moszkal took the runner-up spot in Sunday’s Fenland 10 and led his club to the team prize. The race was won by Colchester Harrier Ramadan Osman in 52.41 followed by Moszkal in 54.44. Other PAC placings were Jon Peet ninth in 58.55 and James Sadlier 29th in 64.57. Werrington’s Paul Halford finished fifth in 57.00. Halford won the race in 2011 and due to careless packing of his kit, did so wearing two left shoes. Martin Gichuhi of Bushfield was eighth in 57.38 and clubmate Eric Winstone was first in the Over 65 age group with a 1:15.50 clocking. Eye duo Peter Ridley and Terry Fone won the Over 70 and Over 75 categories in times of 1:18.17 and 1:25.23 respectively. Johanna O’Regan of Riverside Runners was the first lady home in 1:00.08 and Toni Alcaraz from March AC clocked 1:04.58 for second place. Alcaraz’s March team-mate Geraldine Larham came home fourth, and was winner of the Over 45 category with a time of 1:08.16. Peterborough AC’s Danielle Hart finished sixth in 1:08.51 and with good supprt from Louise Morgan (1:16.52) and Ellen Ellard (1:18.16) PAC were second team. Tracey Barnes of Eye was first Over 50 crossing the line in 1:15.41. 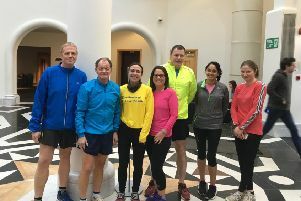 PAC’s Kirk Brawn will run for England Over 40s in the Yorkshire Marathon in York on October 20, 2019. It will be his second England vest.